You are here: Home › News › What is a “Swing Bed”? Our new day room for “swing” patients. Houlton Regional Hospital is an acute care hospital licensed for acute and swing beds. Swing beds are rehabilitation beds for patients that we expect to go home but need short term physical, occupational or speech therapy, intravenous antibiotics or wound care prior to returning home. There are specific guidelines that need to be met to become a swing patient at Houlton Regional Hospital, mostly based on insurance criteria. Swing bed patients will generally remain in their same room during their stay. 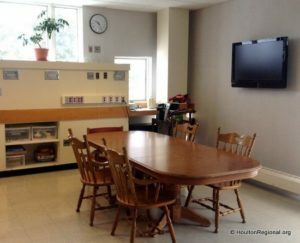 We provide an activities program for our swing patients, including our newly opened day room pictured at the left. Our goal is to provide safe and appropriate care when you need us.